It may just be one of those things but the rise and rise of the Star Wars franchise has coincided neatly with the slowdown in productivity-lifting innovation that has been commented on by people like author Neal Stephenson and economist Tyler Cowen. When I talk about “innovation”, I mean inventions that significantly change and improve the life we’re living today. To provide a benchmark, let’s say “significant innovation” would be the breakthrough technologies needed for interplanetary space travel. 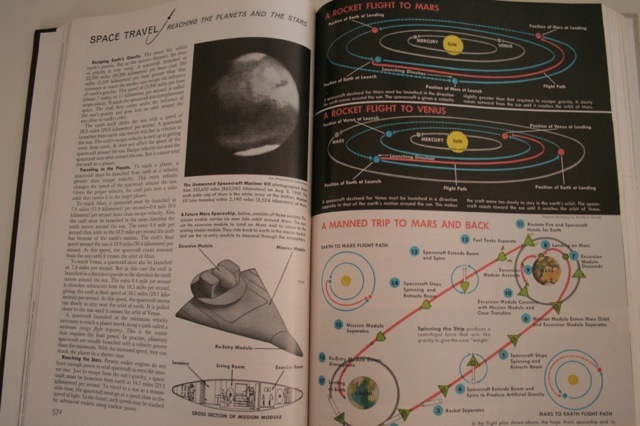 When Stars Wars premiered in 1977, there were plans for human travel to Mars in encyclopedias. The overlap between the triumph of Star Wars and the flattening out of the breakthrough horizon in reality hit home with me while watching my son’s interest in Star Wars grow. I was seven when the first Star Wars movie was released. The excitement for me then was real. And like my brother and friends, I couldn’t get enough of the experience. We drew imagined space ships and colonies, blending what was possible around Earth with what Star Wars spurred us to imagine in galaxies, ahem, far, far away. Decades later, I listen as my six-year-old son reads from his Star Wars Legobook and he asks me what the words “limited edition” or “exclusive” mean. The hardbound book is essentially a catalog of Star Wars merchandise. But the catalog itself is for sale. One more thing to buy. Although my son is creative, nothing about the hardbound catalog of figures requires creativity. Consuming and collecting doesn’t require creativity. For all the celebration of Star Wars, what the Story has become in my lifetime is an Empire of Marketing, full of reissues, limited editions, and ever-newer ways to consume the brands. I’ve watched good minds in my generation move from imagining spacecraft and technology in a time when real technological progress was presumed, to collecting figures and compiling trivia. Over the years, the franchise, in order to grow, achieved new life simply by being injected into other formats: Angry Birds and Legos, for example. Meanwhile, the technological progress we believed was imminent, largely because our parents believed it was imminent – in fact, because they witnessed it in their lives – well, aside from the internet, it never came. 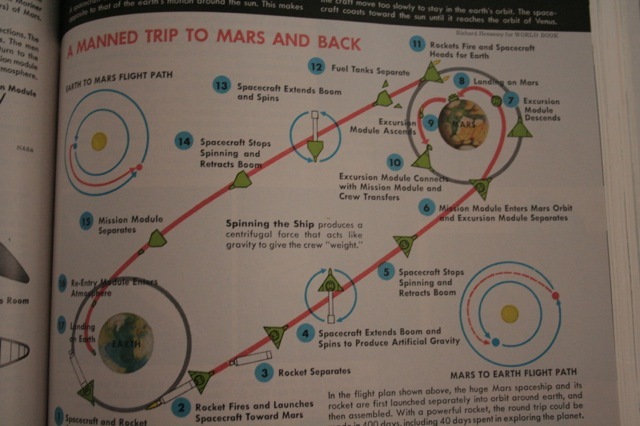 An example of the expectation gap: the 1977 World Book Encyclopedia entry on space travel shows a detailed plan for a trip to Mars. Reading the fine print, it turns out Wernher von Braun, the Father of Rocket Science, actually contributed to the entry. Back in 1977 the presumption around human space travel was simple: after the Moon, then comes Mars. The Mars trip never came. It never even came close. When kids looked up space travel in 1977, this is what they saw. In the 1970s we had the final Apollo missions, Skylab, the Space Shuttle. But by 2014, with Star Wars stronger than ever, the US had lost its ability to put people in space. This isn’t to say Star Wars is responsible for the innovation starvation, or the lack of game-changing technological breakthroughs. It’s a coincidence. It’s not a cause. Yet, even as economists and industrialists look for the Next Big Breakthrough, the New Industry, and a new source of wealth and purpose – and see nothing to come – over there in the toy aisle the Death Star of marketing just grows and morphs and grows again. Societies only have so many hours to spend. What have we been spending ours on? If science fiction is the hieroglyph for the real world, what is the contribution from Star Wars? The franchise expands for the young, the old, everyone in between. It made itself a lifestyle, a collectors item, a cultural touchstone. Heck, it’s a no-brainer from a marketing perspective. 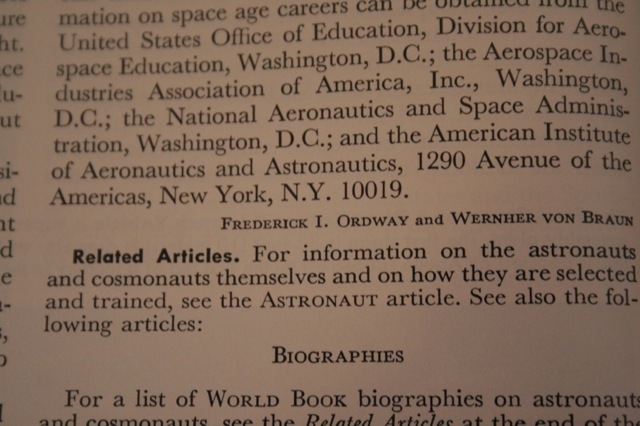 Wernher von Braun’s encyclopedia entry in a 1977 World Book Encyclopedia. it taught, didn’t seem to spark a lot of talk of breaking barriers and achieving the impossible. All of this comes to mind with the release of the book: How Star Wars Conquered the Universe by Chris Taylor. No doubt it’s a good account of how Star Wars rose to its place in our pop-culture. By now Star Wars is practically a genre, a flavor, a way of life. But I can’t help but think that one of the fallouts of the conquest of a generation’s imagination is the kind of consumerist helplessness with us today. Compare it to the shared expectation during Cold War that humanity – if it didn’t exterminate itself – would step higher, grow stronger and achieve things that inspired awe in ourselves. Now that’s an idea from long time ago, in a mindset far, far away.